Switch, the Swiss ccTLD registry, has started publishing a monthly list of the .ch domains with the most DNS traffic, a list that Switch itself currently tops. The list ranks the top 1,000 .ch domains by the number of DNS resolvers that have queried them over the course of a calendar month. By that measure, switch.ch is the runaway number one, with 792,958 resolvers. That’s a long way ahead of Google’s google.ch, which comes in at #4 with 529,846 resolvers. It seems pretty clear that it’s traffic to Switch’s name servers that is likely responsible for its comprehensive lead. That’s underlined by the composition of the rest of the top end of the list, which is dominated by registrars and hosting companies. At #2 is the brand-protection registrar Com Laude, a rank seemingly earned due to the fact that the registrar hosts many of its clients’ high-traffic domains (most of which are .com names) on, among others, a comlaude.ch name server. Switch said its data is collected from its two primary nic.ch name servers and covers all types of traffic. Other such rankings, such as Alexa, measure only web traffic. By counting the number of unique IP addresses doing DNS queries over the course of a month, Switch said it avoids pitfalls associated with low time-to-live (TTL) settings that could occur if it was counting the number of queries. More details on its methodology can be found here. The data itself, which goes back 12 months, can be freely downloaded as CSV files here. Amazon has reversed, at least temporarily, its decision to yank its free list of the world’s most popular domains, after an outcry from researchers. The daily Alexa list, which contains the company’s estimate of the world’s top 1 million domains by traffic, suddenly disappeared late last week. The list was popular with researchers in fields such as internet security. Because it was free, it was widely used. DI PRO uses the list every day to estimate the relative popularity of top-level domains. After deleting the list, Amazon directed users to its Amazon Web Services portal, which had started offering the same data priced at $0.0025 per URL. That’s not cheap. The cost of obtaining same data suddenly leaped from nothing to $912,500 per year, or $2,500 per day. That’s beyond the wallets, I suspect, of almost every Alexa user, especially the many domain name tools providers (including yours truly) that relied on the data to estimate domain popularity. Even scaling back usage to the top 100,000 URLs would be prohibitively expensive for most researchers. While Amazon is of course free to price its data at whatever it thinks it is worth, no notice was given that the file was to be deleted, scuppering without warning goodness knows how many ongoing projects. Some users spoke out on Twitter. The quiet death of the @Alexa_Support top million sites is a grievous blow to internet researchers everywhere. $2500 per pull now. @Alexa_Support I'm disappointed, but I hope you reconsider. The Top 1M list is a standard reference in research. It's simply irreplaceable. I spent most of yesterday figuring out how to quickly rejigger DI PRO to cope with the new regime, but it seems I may have been wasting my time. It seems clear that the key word here is “temporarily”, and that the the restoration of the file may primarily be designed to give researchers more time to seek alternatives or wrap up their research. 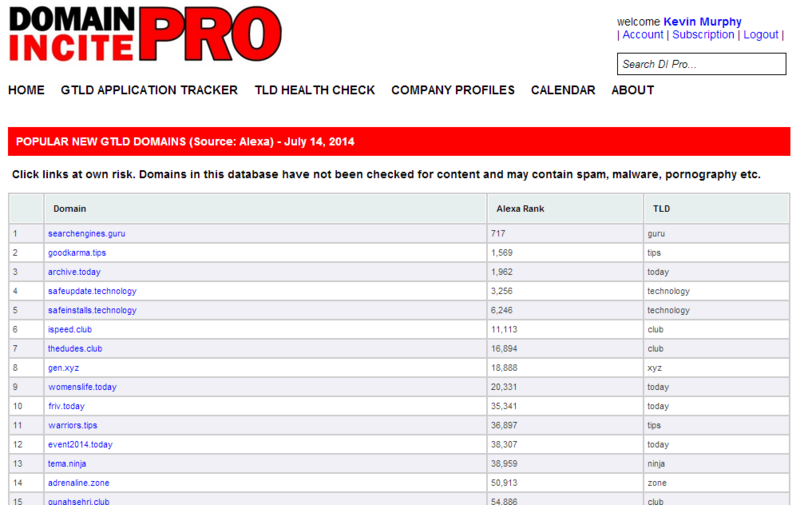 There’s a new domain topping the charts as the most-visited new gTLD site. A few days ago, namu.wiki replaced searchengines.guru in the top spot, the first time the leading position has changed hands since DI PRO first started tracking daily Alexa scores in July 2014.
namu.wiki appears to be a Japanese Korean wiki site dedicated to some kind of manga/anime thing. It was registered in April. searchengines.guru is a Russian forum devoted to discussions of search engine optimization. The Japanese Korean site has an Alexa rank of 1,875 today, compared to 1,994 for the SEO site. The highest score we’ve ever recorded for a new gTLD domain was 717. Interestingly, only two of the site in the top 10 are in English. Two appear to be associated with spam. The usual caveats about the reliability of Alexa data applies.